If your kids are complaining about school, don't lecture them about the gift of an education. 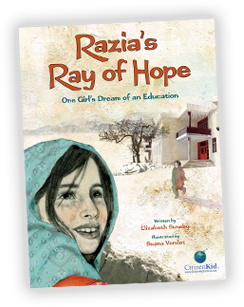 Instead, read them Razia's Ray of Hope: One Girl's Dream of an Education by Elizabeth Suneby, illustrated by Suana Verelst (Kids Can Press, 9/13). This inspiring story is about a brave girl in Afghanistan who must convince the men in her family to allow her to attend school. The author, Elizabeth Suneby, was inspired by Razia Jan, one of CNN’s 2012 Top 10 Heroes of the Year. Jan founded the Zabuli Education Center outside Kabul, near villages where there had never been a school for girls. Instead of telling us information about the school from an insider's perspective, Suneby introduces us to another Razia, a girl who gazes longingly at the school from the outside. Details about life in Afghanistan are seamlessly woven into the story. As they cheer for Razia on her brave quest, American children might begin to understand the value of an education and why so many of their counterparts in other countries desperately desire it.